The AMX-30 B2, announced in June 1979, is essentially an AMX-30 with an integrated fire-control system based on a laser range-finder and a thermal system, new gearbox and other improvements. The French Army ordered 50 vehicles in both the 1981 and 1982 defence budgets and first deliveries were made to the 503rd Regiment at Mourmelon in January 1982. The French Army took delivery of 166 brand newAMX-30 B2 MBTs with 493 existing AMX-30s upgraded to the AMX-30 B2 standard. The COTAC FCS, officially designated the APX M581, has been designed by the AMX-APX in collaboration with the Ateliers de Construction de Tarbes. Its main components are the gunner's APX M544 telescopic (x10 magnification) sight which is combined with an APX M579 electronic control system and an APX M421 optical module containing a computer-controlled graticule. The laser range-finder is the APX M550 and is made by CILAS under the designation TCV 80. It has a maximum range of 10,000 m and is accurate to ±5 m. The SOPELEM telescopic sight has a magnification of x10 and is directly coupled to the main armament. In addition to the M581 range-finder telescope the gunner has a rotatable M282 periscope, a fixed M223 periscope and a TV monitor associated with a thermal monitor. The COTAC FCS also incorporates an accelerometer-type trunnion tilt sensor and a control panel. The tank commander manually inserts information via the control panel concerning the type of ammunition being fired, drift and jump angles, crosswind velocity, altitude and ambient temperature. Apart from the ammunition details, most of this information has to be inserted only once a day. To determine lead angles for the engagement of moving targets, a two-axis gyroscope is mounted on the sight to measure target tracking rates in both azimuth and elevation. Other parameters are automatically acquired by the gunner's range-finder telescope, including target distance, its displacement speed in elevation and azimuth and turret slant. These parameters are processed by a lead computer built into the telescope which transmits the elevation and azimuth corrections to the gunner's day sight by means of an optical compensator and the graticule of the thermal camera for engaging targets at night. The tank commander is provided with an M496 sight (x8 magnification) for firing the 105 mm gun and the 20 mm cannon (land targets). In the cupola, the commander is provided with an M591.02 prism head and an OB-49 periscope for firing the 20 mm cannon (air targets) and the 7.62 mm machine gun. Mounted externally on the right side of the turret is the CASTOR thermal camera with both the tank commander and gunner being provided with a TV monitor screen. The screens display an aiming mark which enables the commander or gunner to engage targets at ranges up to 4,000 m.
The loader has a rotatable M282 periscope and two fixed M223 periscopes, with the driver having a central M223 periscope (or an OB-31A image intensification periscope) and two fixed M223 periscopes. The engine of the AMX-30 B2 has been developed from the AMX-30 and develops 700 hp at 2,600 rpm. The HS-110-2 is fitted with new and more powerful turbo-compressors which provide a 45 hp increase as well as improving the operational life of the engine and its torque characteristics. A new hydrostatically controlled engine system now proposed by Giat incorporates oil heat exchangers cooled by air instead of engine coolant. The air filters now have removable covers to facilitate field maintenance. To allow the AMX-30 B2 to fire the newer APFSDS ammunition a new gunner's sight graticule is fitted to match the ballistics of the round while the turret and ammunition racks have been modified to accept the differently shaped APFSDS round. The SESM ENC 200 is a gearbox of the lock-up torque converter type with five forward and reverse speeds and hydrostatic steering controlled by a conventional steering wheel instead of sticks. This system allows on-the-spot turning and gear changing in bends. The suspension uses new torsion bars which give improved cross-country mobility. As an option it is possible to fit the AMX-30 B2 with connector tracks which are quieter and offer less resistance than conventional tracks. The AMX-30 B2 is also fitted with a new collective pressurisation system with two circuits, one with complete filtration for improved NBC protection. In addition to these improvements, Giat offers a number of other options for the AMX-30 B2. French Army AMX-30 B2s have the OB-49 roof-mounted sight with two day and one night channels. This can be replaced by the M427 with day and image intensification night channels and a laser range-finder or a roof-mounted SFIM M527 gyrostabilised sight. The gunner has an M581 range-finder telescope but the driver's infrared periscope can be replaced by an OB-31 orCN2-516 image intensification periscope. Other options include new 125 Ah batteries with a longer life and needing less maintenance, new filters, DUK DUR 440 radiation counter and different land navigation systems. 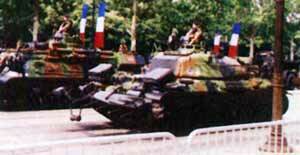 French Army AMX-30 B2s have a thicker gun shield; additional add-on armour protection can be provided for the turret sides and armoured skirts could be fitted. In place of the standard bank of two electrically operated smoke dischargers either side of the turret, the Giat/Lacroix GALIX AFV protection system could be fitted. This can fire a wide range of different types of grenade to meet various battlefield threats. An exhaust system smoke generator can also be fitted to the AMX-30 B2 if required. A number of French AFVs including AMX-30 B2 MBTs and AMX-10 RC (6 x 6) armoured cars deployed to Saudi Arabia in 1991 were fitted with a new decoy/ launcher system developed by Ruggieri of France. 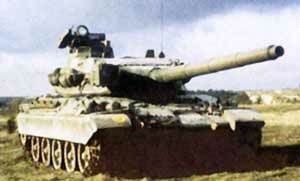 Apart from France, the only known user of the AMX-30 B2 is Cyprus.